Illustrations: 6 b/w illustrations, 3 maps. 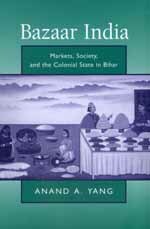 The role of markets in linking local communities to larger networks of commerce, culture, and political power is the central element in Anand A. Yang's provocative and original study. Yang uses bazaars in the northeast Indian state of Bihar during the colonial period as the site of his investigation. The bazaar provides a distinctive locale for posing fundamental questions regarding indigenous societies under colonialism and for highlighting less familiar aspects of colonial India. At one level, Yang reconstructs Bihar's marketing system, from its central place in the city of Patna down to the lowest rung of the periodic markets. But he also concentrates on the dynamics of exchanges and negotiations between different groups and on what can be learned through the "voices" of people in the bazaar: landholders, peasants, traders, and merchants. Along the way, Yang uncovers a wealth of details on the functioning of rural trade, markets, fairs, and pilgrimages in Bihar. A key contribution of Bazaar India is its many-stranded narrative history of some of South Asia's primary actors over the past two centuries. But Yang's approach is not that of a detached observer; rather, his own voice is engaged with the voices of the past and with present-day historians. By focusing on the world beyond the mud walls of the village, he widens the imaginative geography of South Asian history. Readers with an interest in markets, social history, culture, colonialism, British India, and historiographic methods will welcome his book. Anand A. Yang is Professor of History at the University of Utah and the author of The Limited Raj: Agrarian Relations in Colonial India (California, 1989).